The Triangle and two defense can be an effective weapon when the opponents have two outstanding scorers or just as a change of defense to catch an opponent off guard. It can also be used at the end of the game when a team is trying to hold the ball. Three defensive players assume a triangle zone, while the other two players (CHASERS) play all out full pass denial against their assigned opponents. The Triangle Zone provides strong backside support against back cuts. Therefore, the two chasers can really over play the passing lanes. When one of the outstanding scorers does receive the ball, the Triangle Zone provides strong backside support against dribble penetration. 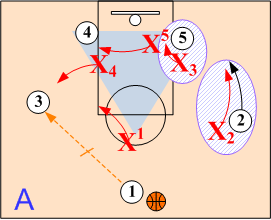 On baseline drives defenders X2 and X5 double team ballhandler O2. Defender X3 continues to deny O3 the ball. 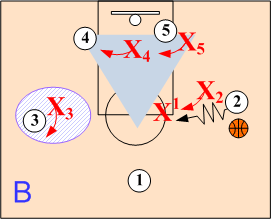 On drives into the middle, X2 and X1 double team O2 while defender X3 maintains strong pass denial pressure on O3. The Triangle and Two defense can also be deployed in combination against a strong inside player and a strong outside player. 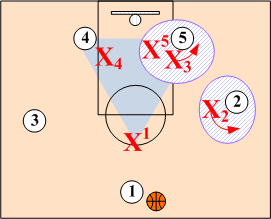 The Triangle Zone along with the chaser will create a double team against a low post player. 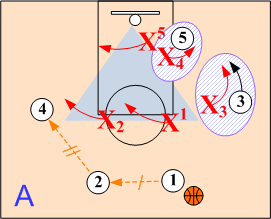 The Triangle zone will also provide the outside chaser with strong backside support against dribble penetration. 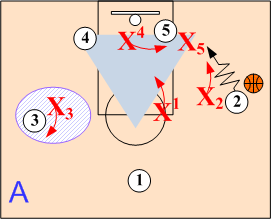 On pass to open wing, defender X4 shows and recovers against O1. X1 and X5 slide over while X3 and X2 maintain strong pass denials. 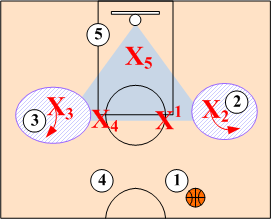 On pass back to point, X1, X4 and X5 reform the triangle zone. 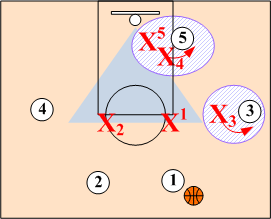 If/when the opponent deploys an offensive alignment with a two guard front, just invert the triangle zone. 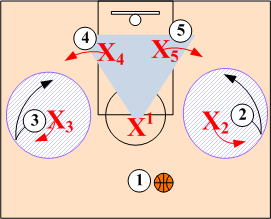 When the Triangle Zone is inverted the triangle shifts are basically the same as a 2-3 zone. 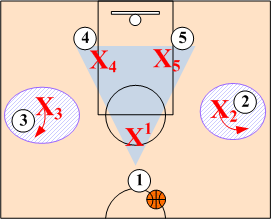 The inverted Triangle Zone automatically creates a double team against a strong low post player any time one of the defensive chasers is assigned to deny the post the ball. 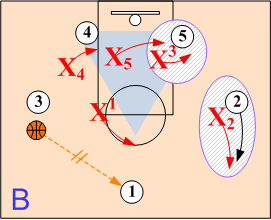 On pass to open wing, defenders X1, X2 and X5 slide over as X3 and X4 maintain strong pass denials. If wing O4 should drive baseline, X5 provides backside support. On pass out to open O1, X1, X2 and X5 re-form the inverted Triangle. The key element to the Triangle & Two defense is the ability of the chasers to deny their assigned opponent the ball. 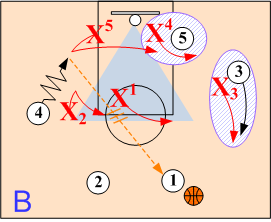 This strong pass denial will not only keep the ball out of the hands of the opponent’s best scorers, but will also completely disrupt and break down the opponent’s set plays and continuities.